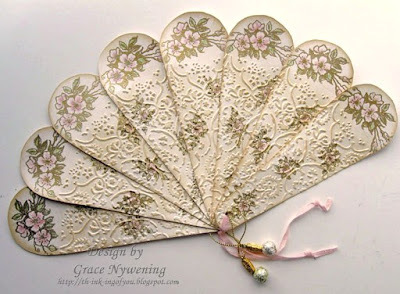 Th-INK-ing of You: Elegant Paper Fan and News! Hello everyone! Happy Friday! I'm excited to show you a fun project I made and to share my happy news with you all. I have been asked to join the Layers of Color Design Team, and I couldn't be more thrilled to be joining with another Christian Company! I have been enjoying using these fabulous images over the past several weeks and really love them. I believe this will allow me to stretch myself in some different directions including some vintage things, which I do really love! So to kick it off, I made this paper fan using Layers of Color Art Stamps set, Merci Bouquets. I love all the little flowers in this set and it's such a versatile set!!! I know I'll be using it often!!! I used the fan template found at Mirkwood Designs. I traced the pattern and hand cut. 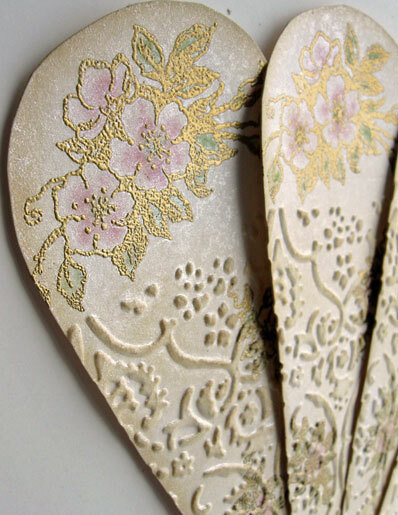 I randomly stamped and embossed each blade with gold and colored with Chalks. 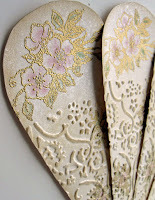 I ran each blade through the Cuttlebug with the Textile folder and then sponged with Adirondack Latte Ink. Finally I spritzed them with Shimmerz in Baby's Breath. I added very fine pink ribbon to the back of each blade, punched the hole at the bottom and added more ribbon and gold cord to which I added some beads. The fan closes up nice and flat. Thank you so much for stopping by today! I hope you enjoyed this project! Have a blessed weekend! Congratulations!! I am so excited for you at this time - looking forward to seeing more of your beautiful work!! This is so gorgeous, just stunning!! Congrats on the DT, well deserved!!! Oh Grace this is so gorgeous!!!!! Congratulations on the DT!!!! So excited for you!!!!! ongratulations Grace! You will be the perfect addition to LOC. I think that your talent combined with the great stamps from LOC is a match made in heaven! This is so beautiful and spectacular and amazing and fantastic. WOW! This is GREAT! What great news too, to be chosen for another DT. Good for you! Grace, this is so gorgeous and a perfect use of this stamp set...I just love it!! What a work of art!! You will be a wonderful addition to the Layers of Color design team, enjoy and can't wait to see your creations!! What a joy it is to work with you! I love your Godly spirit and am blessed by your awesome talents! This is a magnificent work of art, Grace! Wow, what a way to start off, knocking our socks off!! Gorgeous, like all your paperarts! I look forward to a long, joy filled and rewarding relationship! Gorgeous fan Grace! You could frame it or actually use it, couldn't you? Congratulations on the new design team. I haven't been able to decide what set to purchase yet, I love this company, too! Wow Girl!! This is beyond gorgeous!! I just love the gold, the texture, the embossing, the floral.....o.k. everything. I did get your comment. I had the same problem with blogger so I gave up. Hope you have a great weekend!! Congrats on Layers of Color. They are so lucky to have you!! Congratulations Grace you will be perfect for this team.. I LOVE this fan.. After doing Vintage last month I am thinking I will leave it to you.. It was a real challenge for me. You did a terrific job here.. Love the stamps you chose for this project.. Simply GORGEOUS! *Ü* Welcome aboard Grace!! THis is beautiful, Grace! I love your Victorian fan. Congrats on the new design team. You'll be terrific! Congratulations Grace!!! A perfect fit for you, both as a Woman of God, but also as an artist... LOC designs are right up your alley. How truly wonderful! And what an amazing fan, by the way. It looks like one owned by a very upper class lady of days gone by! Congratulations!!! That's such exciting news! You will be a wonderful addition to their team! Your fan is lovely! Very elegant!